I was asked if I could put together the entire series of Facebook live business events into one blog post, well, here you go. These videos represent approximately 4 hours of FREE education and learning time, so please bookmark this webpage so you can find it again and return at your leisure. This training series gives an overview of EVERYTHING that a business needs to focus on in order to thrive – finances, business processes, people and customers. These Facebook live events represent a summary of each of the modules in the dental laboratory business and management course being run by myself in association with Blueprint Dental, bookings for this revolutionary business course for dental laboratories opens soon, so please register your interest now. 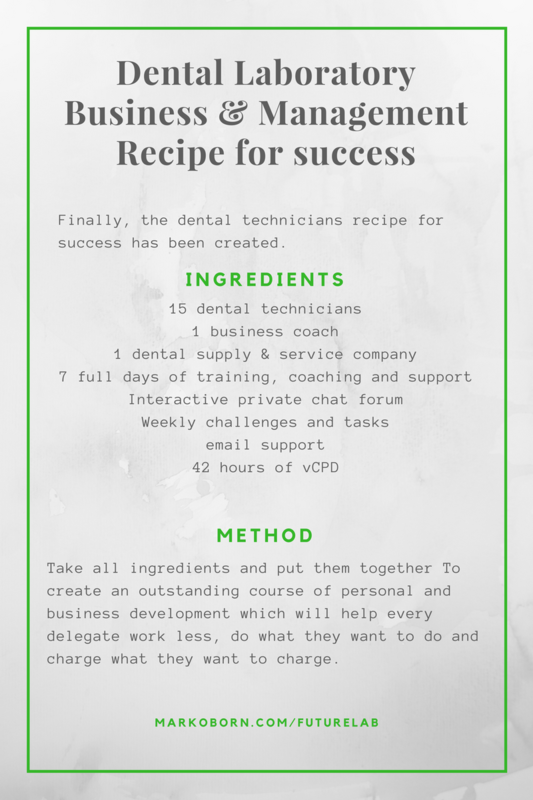 An overview of the 4 key business areas that every dental business needs to focus on to thrive. We take a detailed look at how a profit and loss account, cash flow analysis and balance sheet interact with one another. We will look at how to make business decisions which keep more cash in your business which keeps you more financially secure and comfortable and enables you to invest more readily. This module is specifically designed to help you MAKE MORE MONEY. We take a look at workflow analysis and how you can use each stage of the work process to enhance your business. Where does CADCAM fit in? How can you continuously nurture the relationship with your clients (Customer Relationship Management)? Where is the ‘value’ in the various processes of your business and how can you optimise these to get more clients and work more efficiently (Value Chain Analysis). What future developments can you anticipate now, how can you prepare for them and how can you even predict them? This module is specifically designed to help you be more EFFICIENT and COMPETITIVE IN THE LONG TERM. What motivates you and what motivates other people in your business? If we can truly understand each other’s motivators we can begin to create a Highly Performing Team. If we can eradicate/reduce de-motivating factors within the laboratory it leads to a far more pleasant working environment. This process begins with a robust recruitment policy, how do you find technicians, how should you decide who to employ and how can you ensure you comply with the law? This module is specifically designed to help you have A HIGHLY PERFORMING AND MOTIVATED TEAM. Why should dentists buy from you and not the cheap lap down the road? What are the key factors which contribute to competitiveness and how can you remain as competitive as possible (Porters Five Forces Analysis)? How can you set up a robust and effective marketing strategy that works 24 hours per day 7 days a week without sleeping? What are your personal motivators? Why do so many of us self sabotage our careers and life and how can we stop it? All of these people have attributed their success, at least in part to working with a life coach. When we understand our own thought processes, the strategies we used to make decisions and the reasons we have negative beliefs about ourselves we can make definite decisions to change for the better, not only for ourselves but the people around us. This module is specifically designed to help you to BE WHAT YOU WANT TO BE, DO WHAT YOU WANT TO DO and HAVE WHAT YOU WANT TO HAVE in work and life. Apologies for the tech difficulties, please skip to 3:16 for the live broadcast to begin! Thanks. If you enjoyed this series of Facebook live events please do register now to attend the full 7 day Training programme. This entry was posted in share-labs and tagged Dental laboratory business, Dental laboratory marketing on 1 June 2017 by Mark Oborn.